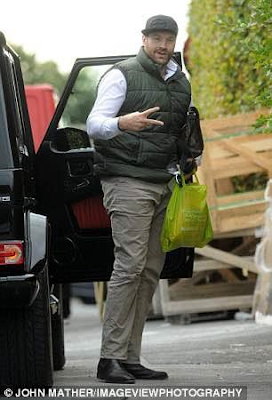 Tyson Fury on Wednesday relinquished his WBA,WBO and IBO titles after deciding to treat himself for depression and cocaine abuse and was for the first time on Thursday spotted arriving at his Lancashire home with a plastic bag containing packets of Doritos among other snacks. The boxer had confessed in an interview to taking cocaine, fighting depression and being suicidal after refusing to turn up for his title defence fight against Wladmir Klitschko twice this year with his blood samples coming up positive for cocaine in the last one month. The British Boxing Board of control planned to meet on Wednesday to discuss whether to suspend or ban Tyson from the sport, which would have seen him stripped of the belts enabling a fight between Wladmir Klitschko and Anthony Joshua but Fury has beaten them to the punch by vacating his titles voluntarily. Meanwhile Tyson Fury's uncle and trainer Peter Fury has vowed that Tyson will return to the ring soon.